Our staff can help you navigate the interview process and share your story. If you have the information you need and the time to schedule an interview, but would like some help organizing your approach, we can help you prepare. A member of Media Relations or a colleague can sit with you during an interview. This can reduce the tension or intimidation of being in a room or broadcast studio with a reporter. Advance notice helps us plan and maximize your coverage. If you have news about a study or a new book that’s about to be published, please try to contact us at least two weeks before the publication date. If you’re looking for event coverage, please submit the details at least a month in advance. This allows interested news reporters time to plan and schedule their coverage. While we discourage nitpicking over minor details or the angle of a published story, do alert Media Relations if there are factual errors and we will help address them. We can help you get the word out to local, regional, or national media. In addition to our online expert list, we offer a gallery of campus photos available for immediate download; an ISDN line for radio interviews; and access to a ReadyCam® studio that allows professors and staff the opportunity to connect with media from the Durham campus. Please contact Executive Director Erika Mantz at erika.mantz@unh.edu at (603) 862-1567 or (603) 969-7916. Reporters work on tight deadlines, so try to respond promptly to requests from the news media – within a few hours if possible. Ask for the reporter’s name, what media outlet he or she represents, the general content and angle of the story, and the deadline. Don’t feel pressure to immediately answer interview questions. If you are hesitant, be upfront and ask, "Is this the interview now or did you want to set something up?" It’s perfectly acceptable to ask for more time if you need to prepare your response or gather information. Talk to the reporter about the interview length and location, and agree to a callback. time, email correspondence or an in-person interview. Find out whether the interview will be recorded. For on-camera interviews, the ReadyCam® broadcast studio is available on the ground floor of the New England Center on the Durham campus. This can save on the expense of travel to television stations in Manchester or Boston. Once you’ve agreed to speak with a reporter, you’ll want to frame your thoughts and approach. Decide what key points you want to communicate. What do you want to say? Be ready for controversial questions by trying to anticipate some of them in advance, and writing out brief answers. Don’t dwell on questions you don’t want to answer. Instead, inform the reporter if you think a question is out of line or has little to do with the subject. It’s also OK to tell a reporter when you don’t have an answer for a particular question. Remember your audience. Think about how your new research is applicable to the "real world," or how a new piece of legislation is going to affect local families. Save the academic jargon for professional journals and use more conversational language that everybody will understand. Assume anything you say to a reporter, whether in the middle of an interview or the middle of a grocery store, is "on the record." While you can tell a reporter that certain information is "off the record,” it’s best to avoid confusion by not saying anything you wouldn't want to see in print or on the local news. Keep comments short and to the point. The "less is more" technique especially applies to broadcast sound bites. Expert comments on news broadcasts are seldom longer than one or two phrases, so try to limit each answer to about 20 seconds. If you are concerned about the technical aspects of a story, politely ask the reporter to read you back your quotes. Don't ask the reporter to send you a copy of the story before it is printed. Very few will, and most will be offended that you asked. Please don't ask for a copy of the story or a tape unless the publication or broadcast is available locally. Find out when the story is running and where you can find it on the web, set your DVR or pick up a newspaper. Media Relations also may be able to locate a copy for you through its online clipping service. Not sure what makes a news story? Research: Results with demonstrated public impact, as well as ongoing projects. It’s best to release the news immediately before your research is published. If you're working on something big that is about to appear in an academic journal, let us know. Public service or outreach projects: Contact us before you visit a city or town and we can alert local media to your visit. Books: Books, authored or edited, that are about to be published. New partnerships: Partnerships with state agencies, projects or research. Innovative courses: Share news about innovative new courses or projects. Meetings and conferences: We can help with advance publicity for events, and we will do our best to encourage news coverage. We will alert the news media, but cannot guarantee a reporter will be . Outstanding students: Know of a student involved in interesting research or community outreach projects? The University of New Hampshire is a flagship research university that inspires innovation and transforms lives in our state, nation and world. More than 16,000 students from all 50 states and 71 countries engage with an award-winning faculty in top-ranked programs in business, engineering, law, liberal arts and the sciences across more than 200 programs of study. UNH’s research portfolio includes partnerships with NASA, NOAA, NSF and NIH, and the university receives more than $100 million in competitive external funding every year to further explore and define the frontiers of land, sea and space. Register your name and email to be able to submit events. A confirmation email and link will be sent to your inbox once you register. Click the link to begin adding events. 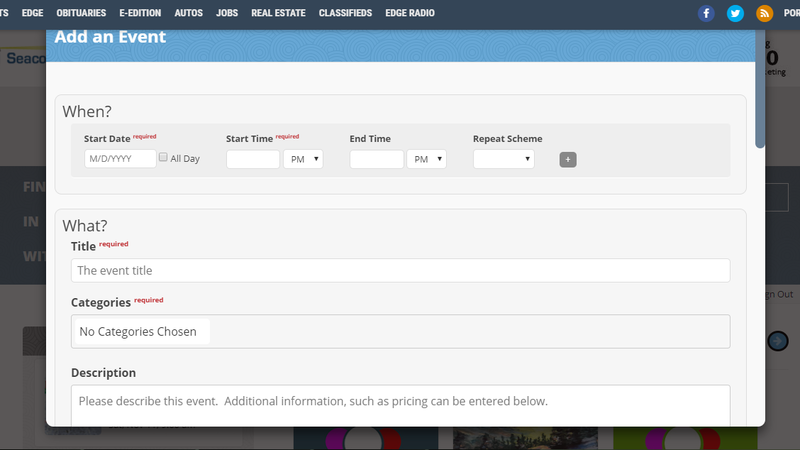 Click the button, “Add an Event.” Fill in the boxes to add an event. Covers all of New Hampshire. Will run calendar listings in between news programs. DO NOT Click “Login,” green button on top left of screen. It is an ad. Click “Post your event,” the second green button on the right. 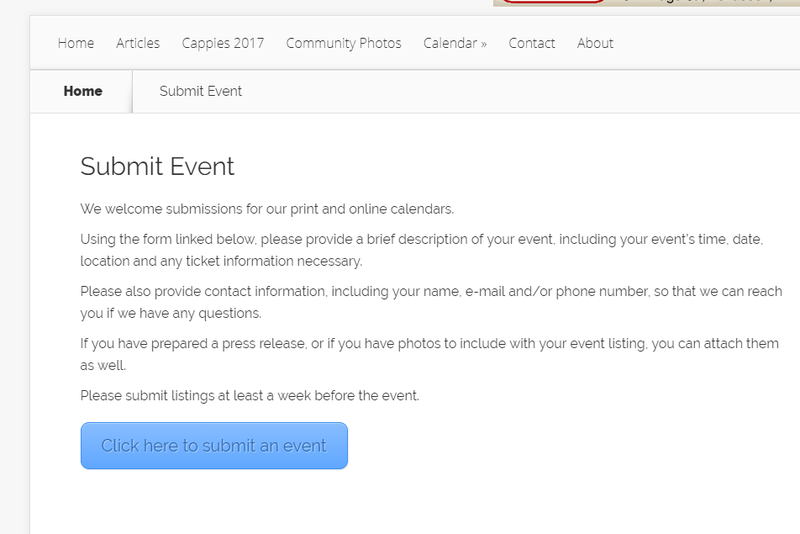 Follow the directions in the form and include event name, your contact information, the appropriate URL and email addresses, a map, and a photo describing the event. You will receive a confirmation email with a link to your event posting after you submit. Covers all of New Hampshire; arts section focuses on Manchester, NH area. NH Weekend published on Thursdays in print. Content can also be found online at http://www.newhampshire.com. Click on blue “Add an Event” button to go to “SpinGo” form. Create an account by clicking “Login” in black bar on top right. Check email and click link to log into your account. Create a username and password. Fill out entire form. There is an opportunity to add photos, URLS, and ticketing information. Once complete, and click submit to review confirmation. Covers the Greater Concord Area. 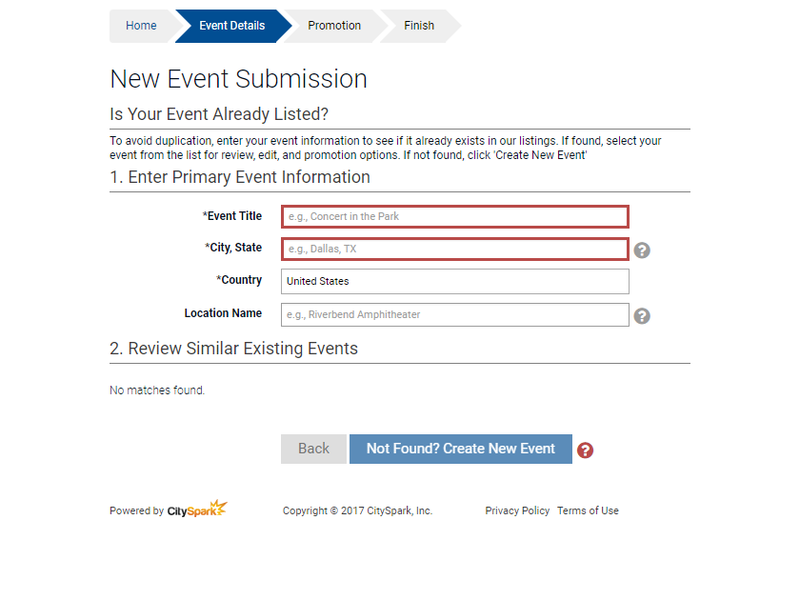 Sign up for a CitySpark account or log in using Google or Facebook, to get to the Event Details screen. Fill in the details. You have the ability to attach photos, ticket information, and links—including embedded video. Fill out completely, then click on submit. The ReadyCam in-house, remotely-controlled studio is available on the ground floor of the New England Center on the Durham campus. This system enables quick responses to live TV interview requests and eliminates the expense of travel to television stations in Manchester or Boston. Media Relations is equipped with an ISDN radio line – delivering high-quality audio for radio broadcasts, interviews and recordings. A weekly newsmagazine featuring stories, photographs, videos and alumni news, as well as the other items of interest to the UNH's extended family and friends. 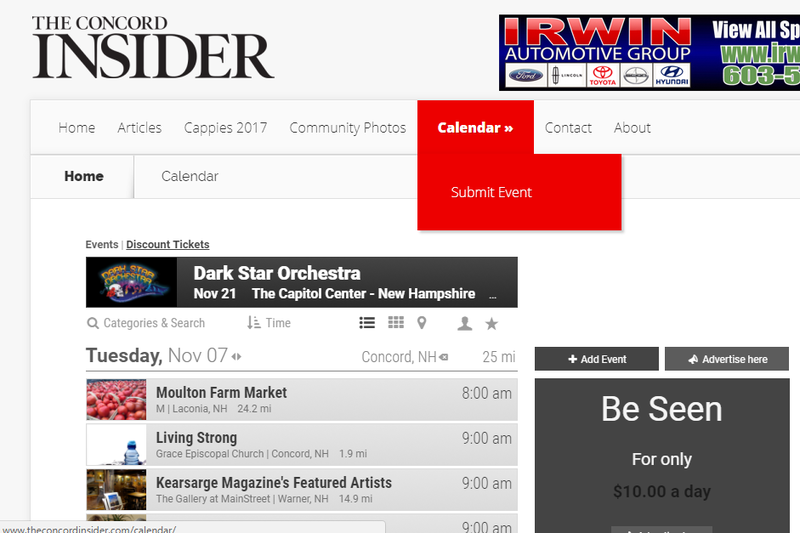 Sponsoring departments or organizations must enter their own information about public events onto the UNH Calendar. The university’s independent, student-run newspaper. It receives all news releases that come from UNH Media Relations. Contact the editors at tnh.editor@unh.edu or tnh.news@unh.edu. Contact the editor, Kristin Duisberg, with story ideas at kristin.duisberg@unh.edu. The university encourages the use of social media to keep in touch with constituents and create opportunities for interaction and discussion. Departmental websites are managed locally. Talk to your department or college's website administrator about posting your news, events or photos on the appropriate sites.